The inaugural Distiller's Week (October 27-November 2), the star of which is the 6th annual Distiller's Showcase of Premium Spirits, features exclusive tastings, from local liquor to whiskeys of the world. The New Hampshire Liquor Commission will host its first Distiller’s Week from October 27-November 2, showcasing hundreds of the world’s best whiskeys, tequilas, vodkas, rums and more in a series of exclusive events. The centerpiece of Distiller’s Week is the sixth annual Distiller’s Showcase of Premium Spirits, which boasts more than 400 premium and ultra-premium spirits for sampling. In addition to the Distiller’s Showcase, NHLC will host a Pappy Van Winkle tasting dinner, a one-of-a-kind Whiskey of the World tasting experience and an exciting, live Cocktail & Mocktail competition — along with several tasting dinners, seminars and in-store tasting and bottle signing events throughout the state. You might say this is the best week of the year for fine liquor enthusiasts of all kinds. The Distiller's Showcase, which is one of our favorite events of the year, is certainly the highlight of the week, but don't miss out on some other great tastings happening around the state. At the live “Cocktail & Mocktail Competition” you can watch finalists prepare lower-alcohol and alcohol-free cocktails, or mocktails, with a panel of judges choosing the winner. The Cocktail & Mocktail Competition, a component of NHLC’s “Live Free & Host Responsibly” campaign, was designed as a fun and interactive way to promote responsible consumption and service of alcohol. The competition, which includes categories for both consumers and bartenders/wait staff, will take place at the Nashua NH Liquor & Wine Outlet in the Willow Springs Plaza on Monday, October 29. Winners will receive $500 cash, Jack Daniel’s merchandise and other great prizes. Visit the Distiller's Week website for more information and tickets as they are made available. Attend an exclusive Pappy Van Winkle Tasting Dinner on Tuesday, October 30, at Crown Tavern in Manchester. The five-course dinner will include samples from Pappy Van Winkle’s line of bourbons. The Whiskey of the World guided tasting event includes both premium whiskeys and cocktails. The event, which will take place Wednesday, October 31, from 5:30 to 8 p.m. at Manchester Country Club in Bedford, will feature five brand ambassadors, light hors d’oeuvres, signature cocktails and a seminar-style tasting experience. Tickets cost $60. Jack Daniel’s will also be sponsoring Lyft for the event, which will provide $5 off for the first two rides for new customers. Guests will be able to purchase products right at the event. Where better than a distillery to start your spirits education? During Spirits Distilled, Nashua's Djinn Spirits owner, engineer and Head Distiller Andy Harthcock will guide you through a two-hour event where you will view a multi-media presentation, participate in a tour of the facility and enjoy a tasting of their award-winning products. It takes place on October 30 at Djinn Spirits from 5:30-7:30 p.m. Tickets are $40. The week also includes a number of tastings that take place at various liquor stores. Brands include Barr Hill, Blueshine Moonshine, Rough Rider Straigt Bourbon and more. See the Distiller's Week list of events for details. Featuring more than 130 tables of premium and ultra-premium spirits for sampling, the Distiller’s Showcase will take place on Thursday, November 1, at the Manchester Downtown Hotel from 6 to 8:30 p.m. As you explore the room, you can meet distillers from around the world, while sampling food from New Hampshire’s top restaurants. In addition to a silent auction, the Distiller’s Showcase guests will also have the chance to bid on multiple bottles of the extremely rare Pappy Van Winkle’s Family Reserve 23 year Kentucky straight bourbon. For the first time this year, each table will feature a signature cocktail for guests to try, in addition to spirit sampling. November 1 from 6-8:30 p.m.
Tickets are $60 and can be purchased here. Another first — more space for more spirits, food and fun. For 2018, the Distiller’s Showcase will take place in the Manchester Downtown Hotel’s expo center, meaning, among other things, more restaurants offering tasty bites. To date, the still-growing list of restaurants includes more than 20 top Granite State eateries, including The Common Man, Campo Enoteca, Republic, Tuscan Kitchen, Bedford Village Inn, O Steaks and Seafood, Canoe, Giorgio's, Fratello's Italian Grille and many more. In addition to more restaurants, this year's showcase will also feature a variety of themed areas, including a speakeasy section, a barber shop area to promote men’s health and a New Hampshire-made products section, which will feature locally made spirits. Keep an eye on the website, as the NHLC will be updating the list of participating brands, presenters and restaurants as the event draws closer. Tickets are $60, and proceeds benefit the Animal Rescue League of New Hampshire (ARLNH). Last year’s Distiller’s Showcase raised more than $137,000 in support of ARLNH. Since 2013, the Distiller’s Showcase has raised more than $345,000 to support ARLNH, which relies on funding from the event to support operating expenses. ARLNH supports more than 2,200 animals and their owners each year, with nearly three-quarters of its operating budget going to animal care and medical expenses. 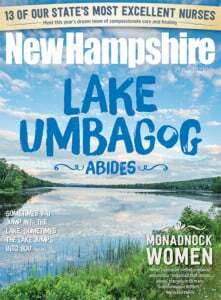 New Hampshire Magazine is a proud sponsor of this event.